What could be better than having your brand in front of your prospects and clients 365 days a year? A well-designed custom calendar is one of the best ways to put your message in front of your audience and have it stay there for an entire year. When it comes to promotional items, did you know that there is a direct correlation between the perceived cost of a promotional item and the message it sends to a recipient? Meaning, invest in your promotional products and you'll be sure to leave a positive lasting impression. 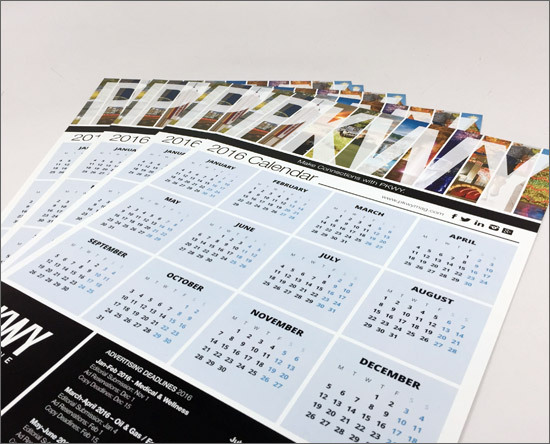 Think of your custom calendars as a marketing tool that can be used throughout the entire year. Perhaps you want to include interesting company dates, incentives, or even a clever line of copy here and there. Depending on your design, you can have different messages each month that highlight seasonal products and services. Don't think of the calendar as just a calendar. Think of it as a way to engage, entice and remind your clients why they need to do business with you. Our team of award-winning graphic designers works directly with you to deliver a finished, custom-branded calendar. It will definitely turn heads, and because our print shop is in-house, you will save money on your calendar while enjoying faster delivery. With everything being handled by us, there is much less wasted time and time in transit. Desk Calendar - A large desk calendar makes an impact by providing the space to be creative. And if brought to work, it occupies a spot where most of us spend the majority of our waking hours. Wall Calendar - Horizontal or vertical wall calendars work well with large format images at the top of each page. You can use corporate images, inspirational images, even children's drawings. Our team can also design custom graphics just for you. Personalized Calendars - Customize your calendar by personalizing each one with the name of a prospect or customer. These get immediate attention and are likely to be used year-round. Ready to tackle your custom calendar project? contact us to get started.